We all want a deal. 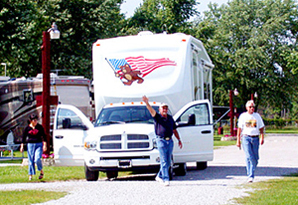 From the young guy buying his first camper shell to the retired couple buying a 40 foot rolling home -- we all want a deal. But what does this really mean? Does it mean that the best deal is one where the customer spends the absolute least amount of money he can? Is the best deal the one where the customer compromises what he really wants so he can get something else for a couple thousand dollars less? Is the best deal one where the customer sacrifices quality in order to save a few bucks? I guess it all depends on your own definition of a good deal. Let me venture forth a definition that I think works pretty well: the best deal is the one in which the customer gets exactly the fifthwheel he wants while getting the most value for his dollar. 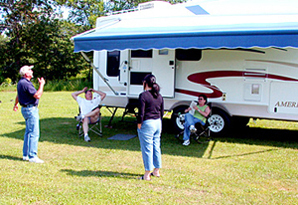 In order to pass on the very best value in 4 seasons fifthwheels, designed to meet the rigors of full timing, we use a unique way to control costs. We simply eliminate many normal big costs experienced by stocking dealers. Stocking dealers need to pay big rent, pay big sales commissions and pay big bank finance interest charges on a large stock of product. 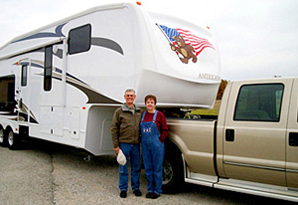 AND our customers normally save big freight charges by checking out and picking up their new Americana model, at our upfitting center, near the factory in Indiana. What’s this!!?? 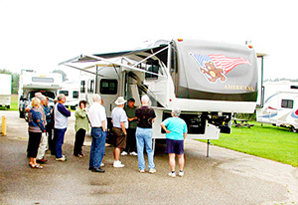 Jerry Lemar demonstrates something important to new owners and shoppers from all over the US – and Canada. The Devines own a KOA Campground in Montana. 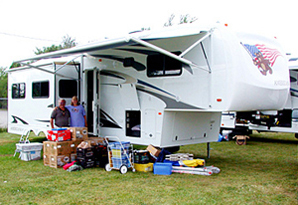 They saw about every kind of fifthwheel in their campground – and chose to buy an Americana. So they could freeze the price of their new Americana model, they placed their order well in advance of when they wanted to take delivery. The Smiths, from Carson, California, relax after a long day of instruction and practice. Check out how we checkout our customers in their new Americanas. 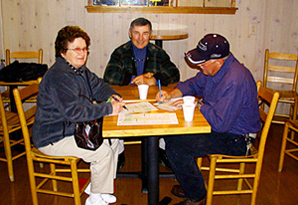 Pat and Claude Precourt from Winnipeg, Canada. 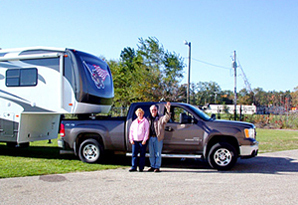 The Precourts are two wonderful Canucks who reported their GMC short bed crew-cab Diesel towed their new Americana model very smoothly back to Winnipeg from Elkhart. 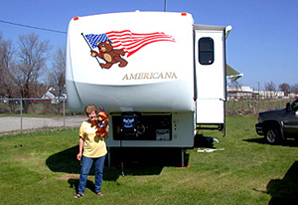 In fact, Paul's brother was so impressed that he contacted us to see if the Americana 4 way adjustable air-ride could be added to his pull trailer.Unfortunately we had to say no, not at this time.